Now I’m pretty sure I don’t belong. As I read the first posts that started to filter into my inbox, I was surprised to see that the group seemed to exist largely to complain about how bad Quora was quickly becoming due to an influx of social media experts touting their own skills by answering questions. Beyond that, the activity stream on Quora is so polluted that the Quora elite found it necessary to use a Facebook group to share interesting questions. I have said much the same thing, but haven’t quite reached the same level of enthusiastic Scoble-bashing that seemed present. For a variety of reasons, Scoble seems to have attracted the most vitriolic attacks against this new wave of users who seek to…well…use Quora. The most influential (so far as I can tell) Quora users are resolutely unified against “Scoble’s love of self-promotion” to the degree that to be accused of being “scoble-like” means you’re the next one up against the wall when the revolution comes. The quotes are somewhat out of context (and most are said in jest) but the general tone is clear. Social media experts should be stabbed repeatedly with painfully semi-blunt instruments until dead, or at the very least rendered mute except for subtle whimpering. Blaming social media experts for promoting themselves on Quora is like slitting your wrists, jumping into shark infested waters and then complaining bitterly if someone so much as takes a nibble. Quora is designed from the ground up to be a social media engine. The voting system, the authentication method, and the notifications are all entirely geared to maximize user retention. (For the laymen, retention means, “bring users back to the system again and again.”) Quora is in no way created to get the “right” answer. It’s taken me a while to realize it, but Quora is not a Q&A site. It’s also not as Scoble stated, “the biggest blogging innovation in the past decade.” It’s a Q&O site: Question and Opinion. Granted, I am not privy to Quora’s leadership and I have not read their mission/vision statement. But no one with an IQ above that of a lampost would put a button that says “Tweet your answer” on a web page without knowing full well that it will be used and abused to rally supporters to upvote your answer regardless of it’s veracity. I have a degree of faith that the founders can indeed outwit far more clever inanimate objects than a lampost and then some. They knew what they were doing. Quora is in the business of getting more users and if they have a company dashboard of metrics they look at everyday to measure their progress, I guarantee you that a truthiness meter is not one of them. The fact that Quora managed to have such high quality content at all is entirely due to the high quality of the initial user base and nothing more. As the system grew, the first set of users rigorously created and then enforced the social norms of the site with great effiicacy. Moreover, the invite only system kept the quality of the users very high for an extended period of time. But as Quora ended the private beta and opened up, the hockey stick growth started swamping any chance for the moderators to enforce any social norms. It’s a free for all for the SEO (Search Engine Optimization) link juice that comes from a well written answer at the top of the page with a link back to your blog. After using Quora for several months and seeing the myriad ways to game the system to get more upvotes, I’ve also seen a dozen ways to reduce the amount of gaming that is going on. Given the intelligence of the quora staff, I assume they probably have two dozen more on the table, but they are not being implemented. I doubt they’re even being tested. Because more upvotes means more opportunities to stroke the ego of people answering questions. The more ego stroking, the more answers posted. The more answers posted, the more SEO, tweets, and shares. The more SEO, tweets, etc., the more users. Although Quora is aware of the issue and is working on a “People Rank” algorithm which will undoubtably be a piece of technical brilliance, the fact of the matter is that Quora needs to drop any pretention of being a place to find the truth and the user elite needs to surrender to the truth that Quora is a place for self-promotion. That’s doesn’t have to be a bad thing. Whether anyone is willing to admit it or not, everyone loves a good ego stroke. (Or any type of stroke for that matter.) Whether it’s getting an up-vote, a new follower, or simply believing that someone out there is reading what I had to say, Quora massages us into loving it. The main complaint really seems to be in differentiating shades of grey. If someone like Ben Mappen pimps their own service but makes the bias clear, is that ok? What about my own answer where I also clearly mention my competitors without any smack talk? Is that ok? After all, the first time I noticed Quora was when I saw 20-30 hits a day coming to my old site from there. I signed up to figure out what was going on and take advantage of it. The only thing that separates me from the more egregious self-promoters out there is that I haven’t been called on it. Both Quora and the user elite need to admit that the SEO and pure ego boosting implications of Quora are too much to resist and no dazzling amount of technical expertise in establishing a reputation graph is ever going to stop people from name dropping and trying to use Quora to their own advantage. The only thing to do is to focus all that self promotion into a useful channel. By accepting that Quora is going to be used for self-promotion, there is a chance to integrate it into the system and create better answers for everyone. But the incentives of the self-promoting gamers has to be aligned with the truth. If someone can get more SEO and more name visibility by posting an irrelevant picture and loading their answer with keywords and links, that’s what’s going to happen. Without a sufficient place to link back to your own blog right at the top, people will invariably insert one into the post. If the answers were made anonymous, people would just post their names directly. The good news is that there are a lot of solutions out there, and most of them don’t require a year of R&D to implement “People Rank.” They just require a systems level view and an acceptance of reality. I don’t know the magic trick to make everything alright and I’m sure I’ll get bulldozed for this post. But I’m quite certain that the argument of the week has gone from silly to absurd in a fairly short period of time. 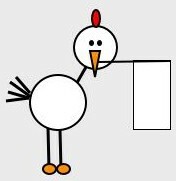 We need a dose of calm, reflection, and perhaps even a poorly drawn stick figure chicken. Tristan Kromer is not a ninja. He does however occasional self-promote his blog, his numerous (and often silly) projects, and whatever else he finds interesting. Not unlike the treatment accorded to “the less worthy” by Apple fanboys. Tristan, I agree with you almost 100%. The “almost” is because I do not believe that everyone uses Quora for purposes of self-promotion. For example, while I do get an ego boost when people vote up my answers or leave a comment of praise, I don’t have a blog or company I’m promoting and I’m not some “personal brand”. I just try to provide useful comment when I have something to contribute and try to provide subversive humor when I think people are taking themselves too seriously. I think lots of other users also aren’t linking to their blogs or posting self-promotional responses unless it is a question that has some relation to what they do for a living. But, I agree, almost everyone appreciates a compliment. THAT SAID, I’ve said ad nauseum on Quora that they are holding an untenable position. They are not serious enough about being “factual” to enact a set of understandable standards (like Wikipedia’s Neutral Point of View & Cite Your Sources expectations) but the site also squashes fun and doesn’t allow any “play” which will inhibit new users from signing up. Quora manages to both be not serious enough and take itself way too serious. Aside from a few smarties who bring in some stats (sources not always provided) with their answers, Quora answers are mostly opinions based on learning & life experience. That is the strength of the site. But it is misleading to ever present it as a “knowledge base” (in some objective measure of knowledge). People offer advice, stories, recount successes & why they succeeded, talk about their favorite films, recommend the best karaoke songs, reminisce about living through the Dot Com crash, mention the best place to go for tacos in San Francisco or argue about how you know when a girl wants to be kissed. From both a personal & sociological viewpoint, I find this all compelling enough to keep going back. But they are opinions from distinct perspectives, not factual information. It’s misleading to say otherwise. Ugh, typos. Remember to proofread, Liz. Absolutely, I 100% agree with you. Not everyone who posts something on the internet is doing it for self aggrandizement… except possibly for behavioralists and Freudians. 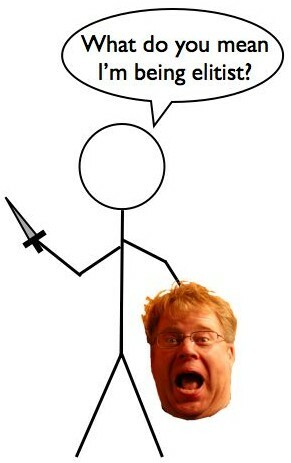 You are currently reading Robert Scoble’s Severed Head, Truthiness, and the Surrender Chicken at The Quora Review.